With the winter of 1940/41 approaching, and the likelihood of an invasion reduced, the Home Guard Sub-Committee of the Army Council, at its meeting in October 1940, had decided that, with the longer nights and the fact that dawn and dusk would occur during the hours of civilian employment, the standard of vigilance maintained up to that time could not be continued during the winter months. Manning of observation posts and night patrolling would begin again in the spring of 1941. However, indoor training and lectures in the evenings were not to be neglected and Sunday morning outdoor training would continue through the winter. Social events were also organised to build team spirit and comradeship. The Drill Hall in Red Lane, which Harry Workman confirmed to me had been taken over by the Tewkesbury Home Guard quite soon after it was formed, was used for very popular ‘smoking concerts’ as well as indoor training. 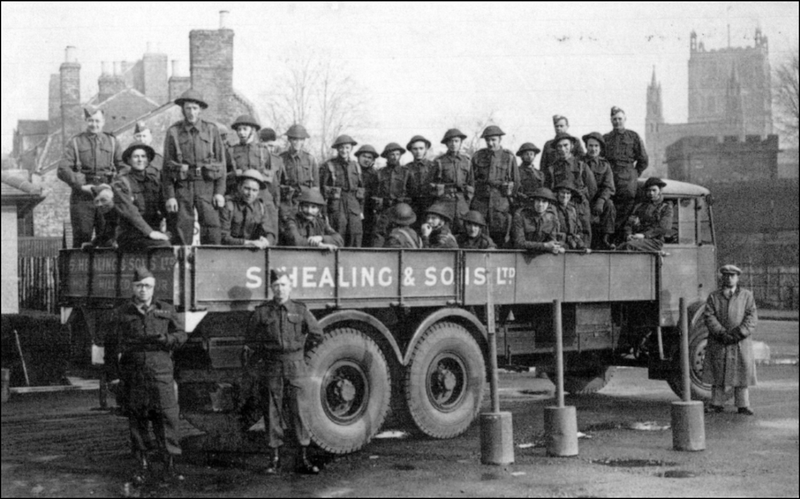 Towards the end of 1940, it had become obvious that the area covered by ‘A’ Company of the 1st Gloucestershire (Cheltenham) Battalion Home Guard was too large, and on 1 January 1941 the western portion of the ‘A’ Company area, including Tewkesbury, was separated to become the ‘E’ Company area, with a force of about 250 men. It was commanded initially by Major R. Philipson-Stow, with Lieutenant (later Captain) Comins as his second-in-command. Headquarters was established in the Old Hospital at Tewkesbury. The platoon structure of the ‘new’ ‘E’ Company comprised the Tewkesbury Platoon, which included the men from Forthampton and Chaceley, commanded by Lieutenant Albert Berry; the Coombe Hill Platoon, commanded by Lieutenant S. Bass; and the Twyning Platoon, commanded by Lieutenant B. Fletcher. The platoon structure was soon altered again so that the Healings Mill and Forthampton Sections became a separate Platoon, commanded by Lieutenant J.W. Healing. In addition to their operational duties, each platoon spent one, and sometimes, two, evenings a week on drill (old soldiers’ habits die hard!) instructions, lectures and demonstrations. Weekends were devoted to range practice and tactical exercises, with battles against their neighbouring units. ‘E’ Company was fortunate in having good NCOs, ‘old sweats’ of the Great War, who, with instructors from Cheltenham sent out to the platoons every week, soon had the men giving a good account in events staged to test preparedness and efficiency. In order to give more authority to the Home Guard, and to bring it more in line with the Regular Army, it was announced in April 1941 that the King’s Commission would be granted to officers, with the following senior ranks established: Battalion Commanders: Lieutenant Colonel; Company Commanders: Major; and Platoon Commanders: Lieutenant. The issue of the standard army-issue battledress was also made in instalments during 1941, together with ‘Home Guard’ shoulder titles, to replace the rather shapeless denim overalls and armbands supplied in 1940, bringing the volunteers up to the standard of smartness of the regulars. A number of mock attacks were made on Tewkesbury to test the defences of the town, and particularly the river crossing at the King John’s Bridge. Details of one of these exercises, held on Sunday 4 May 1941, have come to light at the National Archives. The exercise was designed specifically to test the communications and liaison, not only between adjoining battalions of Home Guard, but also between those of the adjoining Home Guard Zones of Worcestershire and Gloucestershire. ‘Enemy’ troops were provided by the Royal Air Force and Regulars. The defenders were men of the 37th Searchlight Regiment site at Mitton, the Royal Army Service Corps at Ashchurch; ‘D’ and ‘E’ Companies of the 5th Gloucestershire (Gloucester) Battalion, other county units and, of course, Tewkesbury. To distinguish the two sides, the enemy were to wear steel helmets, while the defenders would wear forage caps. Umpires and directing staff were identified by white cap bands and the spectators (military) by a white band around their left arm. For the purpose of the exercise, it was envisaged that a strong enemy force had landed at Swansea on Friday 2 May with the intention of advancing on Birmingham to destroy munitions works. By the evening of 3 May their advance guard had reached the line, Newport-Abergavenny. A ‘captured document’ was purported to say that the enemy intended to land an airborne force with the intention of capturing the crossings of the Rivers Severn and Avon between Ashleworth and Twyning. At 9.00am, the defending forces were given the command: ‘Action Stations’, at which point the men of the defence forces would go to their allotted positions (these would be their observation posts, weapons positions and road blocks). An hour later enemy parachute troops, represented by green flares, were to capture an unspecified landing ground to the west of the Severn (this was probably Berrow Airfield), followed at 10.30am by enemy troop-carrying aircraft landing with light tanks, which would then attack the crossings over the River Severn. At 11.00am more parachutists were to capture a landing ground to the east of the river (probably Defford Airfield), followed again by troop-carrying aircraft, the troops from which were to endeavour to join forces with those landed to the west and for both groups to consolidate their positions on the river. Barricades (roadblocks) were immediately to be erected by the defence forces when enemy troops were reported to be near. ‘Harvey Flame Throwers’ were to be used to defend the bridges. The exercise was to finish at 2.30pm, after which the umpires would meet at Dean Close School, Cheltenham, to compare notes and where the outcome would have been decided. Two YMCA mobile canteens were to provide tea at 4.00pm – but on payment. No favours there then! The outcome of this particular exercise is not known, although Major Jewell, commanding the Upton Company, was able to report that, during the ‘Battle of Tewkesbury’, the commanding officer of the 1st Gloucestershire Battalion Home Guard had highly complimented the Bushley and Ripple Platoons (of the Upton Company) for having fought an excellent rear-guard action. Towards the end of 1941, the ‘E’ Commander, Major Philipson-Stow, was appointed to the post of Town Commander, a position that, up to that time, had been held by an officer from the RASC Depot in Ashchurch. Consequently Lieutenant W.J. Healing assumed command of the Company. Since July 1940, there had been a steady trickle of weapons and ammunition to the Home Guard, mostly of American manufacture, including the .300 calibre P17 rifles with the 17-inch bayonet, which were to become synonymous with the Home Guard. 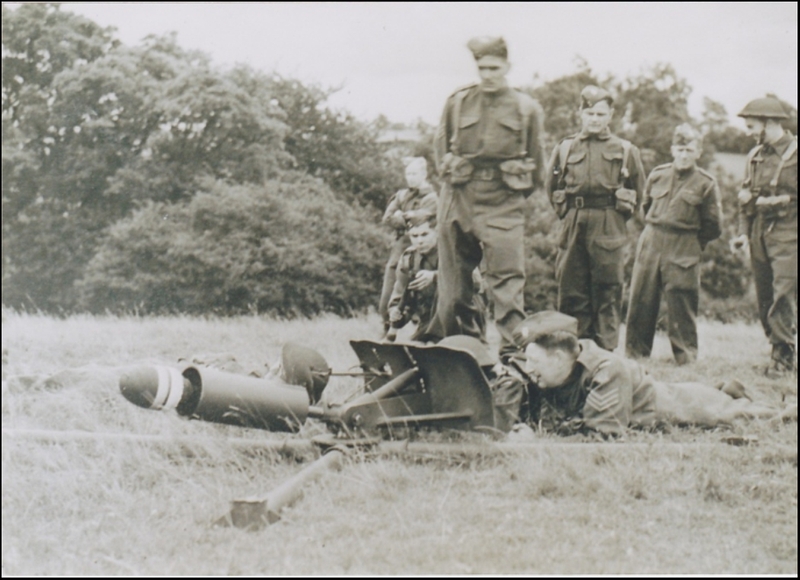 However, 1941 also saw the supply of much heavier, British-made, weapons: the ‘Northover Projector’, the ‘Blacker Bombard’ (later called the ‘Spigot Mortar’), and the ‘Smith Gun’. Described as sub-artillery, these were rather crude – but effective – anti-tank devices. This steady flow of unfamiliar weapons to the Home Guard resulted in additional training as each new weapon appeared. ‘E’ Company apparently became pioneers of the flamethrower (presumably the ‘Harvey Flame Thrower’ referred to earlier), with an ‘expert section’ formed by Lieutenant Burgess. Several demonstrations were given at Tewkesbury and at Aggs Hill, Cheltenham. The Company also became proficient with the ‘Northover Projector’ with its transporter and tractor, which was described as a “combination of great ingenuity”! Early in 1942, a new company – ‘F’ Company – was formed by the 1st Battalion: and the very efficient Coombe Hill Platoon was transferred from ‘E’ Company, taking with it one officer and 35 other ranks. At the same time, Sergeants Cliff, Healey and William Workman (older brother of Harry) received their commissions and took over the Twyning, Smith Gun (presumably based at the Drill Hall) and Forthampton Platoons respectively, while CSM Raggatt  was promoted to replace Twyning Platoon’s Lieutenant Cliff who had transferred to another district. The spring of 1942 also saw the introduction of compulsory service to the Home Guard at the request of the Commander-in-Chief Home Forces. One effect of this change was that the ‘other ranks’ of the Home Guard would no longer to be referred to as ‘volunteer’, but ‘private’. The increase in numbers, with the addition of directed men, enabled the force to take on more of the home defence duties and allow regular troops to be released for foreign duty. The change in status was also to impress on the country at large the importance of the Home Guard, and the urgent necessity of bringing it up to the highest level of efficiency and preparedness. In a statement by the then Director General of the Home Guard, it was announced that weekend camps for the Home Guards were also to be introduced, providing the opportunity for the men to train specifically for the anti-invasion role. However, large-scale offensive operations would still be the function of the Regular Army, while the Home Guard would continue to protect their own localities against the airborne enemy. Weekend camps were to be held for Home Guards from Friday night through to Monday morning and exercises were to be exclusively related to defence needs. A large increase in permanent staff instructors was also promised. Harry Workman can remember bivouacking on the Ham, which was presumably for anti-invasion training purposes. Before the change in status, and while it was still a volunteer force, a Home Guard could leave the service after giving fourteen days’ notice that he wished to resign. Many did just that in the period immediately before the introduction of compulsory service. Those that remained in the force, after the change, were expected to perform training or operational duties for periods not exceeding 48 hours in four weeks. Compulsion was not universally accepted, but considered necessary to obtain more men and give authority to officers. Punishment, through the civil courts for non-attendance at training parades or for operational duty, usually resulted in a £5 fine or imprisonment. Matters were becoming serious! The Tewkesbury Register records that a number of men of the adjoining Evesham Battalion of Home Guard were prosecuted, but there were apparently none in the Tewkesbury area. Edward Lane could not remember that happening in the Tewkesbury area either, because he thought that “they were too dedicated”! 1942 saw the introduction of the ‘Sten-Gun’ to the Home Guard armoury. This was a crudely made automatic weapon which was considered to be much more effective than the rifle in towns. Town guards, like the Tewkesbury unit, were likely, therefore, to have a higher proportion of these new weapons. 1942 also saw the enrolment, subject to parental consent, of boys of 14 to 16 in the Home Guards for use as messengers only. The numbers were to be limited and preference would be given to those already in the cadets; training would include the use of arms. This year also saw the acceptance of women in the Home Guard, who could be registered with, but not enrolled in, the force. As early as December 1940, a request had been made on behalf of the ‘Women’s Defence Corps’, an unofficial women’s organisation, which was armed and prepared to fight for the country, for their enrolment in the Home Guard. Their cause was championed in Parliament by Dr. Edith Summerskill, MP, but the government refused the request on the basis that there were other forms of service for which women were required, such as the ATS, and “because of the need to retain simplicity in Home Guard administration”! The government had already been in discussion with the WVS about their cooperation in providing support to the Home Guard for clerical work, cooking and other auxiliary service, on the understanding that there would be no formal recognition or enrolment in the Home Guard. By 1942, the government had relented. Women were allowed into the Home Guard but only with the following conditions: they would be given a lapel badge to wear on civilian clothing, but would receive no uniform. (In fact, many local Home Guard commanders did supply ‘their’ women with uniforms). ‘E’ Company HQ, and possibly some of the platoons, would have had at least a few women on their roll, although no information for this has been found. It is worth emphasising that, during its wartime existence, the Home Guard countrywide lost 1,206 men of all ranks killed during the course of their duty, with 557 wounded. Some of these casualties resulted from training with unfamiliar weapons and one of them was Sergeant Arthur Hanlon, a baker and confectioner at 112 High Street, Tewkesbury. 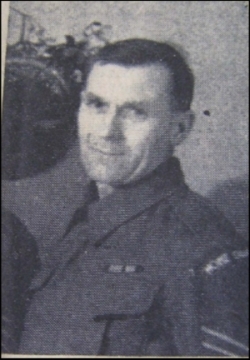 Hanlon was 47 years of age on the day of the accident and was described as an enthusiastic member of the Tewkesbury Home Guard Company. He had served in the Tank Corps during the Great War and, after a period of garrison duty in Germany, was ‘demobbed’ in 1919. He had been one of the first to volunteer for the LDV and his enthusiasm and attention to duty had been an example to everyone. He lost his life on 19 November 1942, as a result of an accident during indoor ‘Spigot Mortar’ practice at Healings Mill. An explosion had occurred which not only severely injured Sergeant Hanlon in one leg, but also flung over colleague, Richard Wise, and demolished a wall at the mill. Both men were treated at Tewkesbury Hospital, Sergeant Hanlon having his injured leg amputated. However, he died in the early hours of the next morning and was later buried, with military honours, in Tewkesbury Cemetery, where his grave is marked by a Commonwealth War Graves Commission [CWGC] headstone. This can be seen, along with casualties of the regular forces, in a small concentration of such headstones, on the right as one enters the Cemetery. However, his name was not included on the War Memorial. 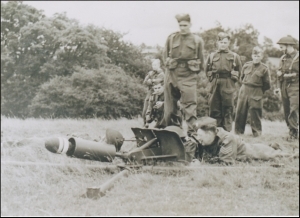 It is significant that orders were subsequently issued to Home Guard units that “bombs, spigot mortar practice, will not be used other than on open ranges” and their specific markings were to be clearly explained! 1942 saw the arrival of Americans in Britain as part of the build-up of troops and equipment for the eventual invasion of Europe, a process code-named ‘BOLERO’. The headquarters for the American Service of Supply was located in Cheltenham, with a number of large storage depots located in the countryside around, including the former RASC depot in Ashchurch. Apparently, relations between the Americans at Ashchurch and the Tewkesbury Home Guard were always most friendly, so much so that senior American officers and their units offered to serve under the Town Defence Commander, Major Philipson-Stow, in the defence of Tewkesbury. With large numbers of American troops and equipment coming into Britain from 1942 onwards, a full-scale German invasion was now unlikely to be successful, but one of the risks recognised by the War Office was that the Germans might organise destructive raids to disrupt the build-up of men and munitions, or undertake ‘smash and grab raids’ to carry away secret apparatus, or carry out armed sabotage causing major damage to an installation or establishment, or more subtle sabotage by one or two agents. While the Americans would be expected to guard their own establishments, the Home Guard would consequently make the protection of other vulnerable points a priority from 1942 until June 1944, under the codename ‘VITGUARD’. Towards the end of 1942, Major Philipson-Stow resigned his commission on leaving the district and Captain J.W. Healing took over the Company, consequently being promoted to Major. Lieutenant W.J. Healing became his second in command with the rank of Captain and Captain Comins was appointed as Liaison Officer. In 1943, the strength of ‘E’ Company was increased by the absorption of men from Apperley, under the command of Lieutenant Moffat, which for some reason had not been included in ‘F’ Company. However, during this period ‘E’ Company was continually approached to provide recruits for Home Guard anti-aircraft units; some 40 men from it were transferred for this purpose. This use of Home Guards for anti-aircraft gunnery duties was not unique to the Gloucestershire area, but occurred nationally as many of the men of the regular Royal Artillery anti-aircraft regiments were diverted to overseas service and needed replacing around the key vulnerable points. Harry Workman was one of those Home Guards from Tewkesbury who volunteered for this duty. He, and his colleagues, would be collected from The Cross in Tewkesbury at 6.00pm to travel to Staverton, where they would stay overnight and help man one of half-a-dozen heavy anti-aircraft guns sited in the countryside, near the airfield. The role of the Home Guards was to feed the large and heavy shells to the guns, where they would be loaded into hoppers, ready for firing, all of this being under the direction of Royal Artillery Officers. Unless there was an emergency call-out to the guns, or there was a practice drill, the Home Guards would sleep in huts near the guns until the next morning, when they would be returned to Tewkesbury by 6.00am, and prepare themselves for another day’s work. Throughout the period of its wartime existence, there was to be little rest for many of the Home Guards! Separate research indicates that a number of heavy anti-aircraft gun batteries were located in a broad circle around the 'Gloucester/Brockworth Gun Defended Area' [GDA] to protect the factories at Hucclecote and Brockworth, which were providing aircraft for the air war against Germany. This GDA also included the important Rotol airscrews factory at Staverton. Each gun battery would have a cluster of four or more 3.7-inch calibre anti-aircraft guns, radar and gunnery control facilities, and the small encampment for the crews, remembered by Harry. Eighteen such batteries were located around this GDA for most of the war. Home Guard units everywhere were encouraged to celebrate their third birthday on ‘Home Guard Sunday’ in mid-May, by parading through their towns and by demonstrating their skill at arms with their now extensive armaments. Tewkesbury was no exception and ‘E’ Company gave a public demonstration of their efficiency. Saturday, 13 May 1944, saw the start of ‘Salute the Soldier Week’ in Tewkesbury, which was marked by a grand parade through the town. Led by the band of the Gloucestershire Regiment, the parade included US soldiers, a RAF contingent, ATC and Sea Cadets, together with local sections of the Home Guard. Afterwards an open-air ‘drumhead’ service was conducted in the Vineyards. On 4 June 1944 and in the run-up to ‘D-Day’, 24-hour guards were placed by the Home Guard on essential vital points in the communications infrastructure. Most important were the railways, which were now being intensively used to transport mainly American troops and equipment down through the Midlands to the south coast ports in readiness for landings in Normandy. It was fully expected that German paratroops would be landed with the aim of disrupting the transport and communications system. The bridging points over the rivers around Tewkesbury would have been vital elements of the transport system to be guarded. Edward Lane, for example, can remember doing guard duty on the Mythe Bridge. 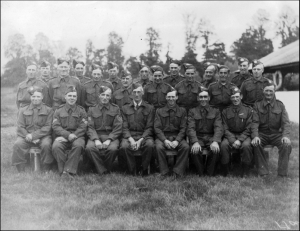 On 11 September 1944, with the campaign in Europe progressing well, the Home Guard was instructed to cease operational duties and guards were withdrawn from vulnerable points. However, for the rest of the year, every weekend showed strong and enthusiastic attendances at rifle shooting competitions. At the same time, GHQ Home Forces put it to all Home Guard commanders that there was no longer any need to maintain the Home Guard operational defence works and that it may be possible to solve the problem of clearance by asking the Home Guard to assist ‘voluntarily’ in the dismantling of them. It was considered likely that this would take some time and, in fact, it did present a considerable manpower problem in the post-war period. This would be the final task of the Home Guard. Sunday, 3 December 1944, marked the formal ‘Stand Down’ of the Home Guard. On this day, throughout Britain, parades were held in most towns and cities, including London, where the King took the salute from the grand parade of Home Guardsmen, representing all parts of the Kingdom. At Tewkesbury, a full parade of officers and men from ‘E’ Company, under the command of Major J.W. Healing, marched through the town to Vineyards, where a final stand down ceremony and service was conducted by the Mayor of Tewkesbury, the Alderman Rev. H.G. Brown. The ceremony was attended by a goodly number of the townspeople, despite the unkind weather. The service began with a ‘minute’s silence’ in memory of Sergeant Hanlon, followed by the hymn Oh God Our Help in Ages Past. In his address, the Mayor declared that the Home Guard, in common with their comrades throughout the country, had done a splendid piece of work for which everyone was grateful and of which they were proud. He reflected on the need for the Home Guard and the fact that “Germany had emulated them”. (This was a reference to the ‘Volksturm’ raised by the Germans in the last year of the war.) He added that the Home Guard had relieved regular soldiers for duty overseas. After singing God Save the King, the salute was taken by Major Healing, before the Home Guards took tea at The Hot Pot, served by staff of the British Restaurant and the women’s section of the British Legion. A silver cigarette case was presented to Major Healing as a token of appreciation by the Company. He in turn expressed his thanks to the officers and men for their help. Edward Lane recalls the tea being taken in a cafe to the left of the Abbey gates, presumably where the tearooms are now. Perhaps surprisingly, the stand down was not universally well received in the Home Guard. Many felt that they had been prematurely sidelined and too quickly disarmed, thereby destroying the sense of comradeship that had built up during the war years. Some units tried to keep the spirit alive by forming Home Guard Associations and rifle clubs, but no evidence of this has been found for Tewkesbury. However, the local newspaper did record the suicide of George Simpson of the Evesham Battalion, who had been depressed since stand down. It was reported that he had missed the companionship and had lost interest in everything. He was described as an old soldier who took his war seriously. The force lingered on to be disbanded finally at the end of December 1945. Although the final disbanding of the wartime Home Guard in 1945 seemed to be the end of the force as far as the men were concerned, discussions would soon take place in various government defence committees during the post-war era about the reconstitution of the force in case of future wars. New perceived threats to Britain during the ‘Cold War’ period, particularly the Berlin Blockade in 1948, added impetus to these discussions, which included the possibility of reviving the Home Guards as a defence against air landings (just as before), to help the police in controlling civil unrest and dealing with a possible communist inspired ‘Fifth Column’. The start of the Korean War signalled a further communist expansion and more discussion. However, it was the return to power of Winston Churchill in 1951 that actually brought about the re-formation of the Home Guard. The consequential Home Guard Act of December 1951 required volunteers to sign on for two years, and undertake a minimum of 15 hours training every three months. Recruiting was very much slower than in 1940 and most units did not reach the size envisaged. Tewkesburians, again, volunteered for this new force, but little is known about organisation in the town or what they did. The new force reverted to reserve status in April 1956 and ceased to exist in the July of that year. Were it not for the popular television series, Dad’s Army, which is still being repeated on television, the Home Guard would, I am sure, have been largely forgotten. Unfortunately, the TV impression is the only one that many people will have of the Home Guard. It is, however, a distorted view, to the point of unjustified ridicule. It is difficult now, after so many years, to undo the harm to the reputation of the force that the programme has caused – the force is now almost always referred to in newspaper articles as ‘Dad’s Army’, a title that the author considers derogatory. In conclusion, therefore, two quotations from official statements will reflect the proper importance and efficiency of the Home Guard in World War II. With the full cooperation of the British authorities, the Home Guard, as well as its equipment and training, was closely investigated in early 1941 by the representatives of the Massachusetts Committee on Public Safety, who subsequently reported their findings to the US War Department in Washington. It produced a long report, which included the results of interviews with leading military figures from most of the countries that had been overrun by the Germans, as well as those from Britain. It concluded that the only way to meet the German offensive tactics, of penetrating the defence with their Panzer divisions and air forces, was firstly by use of like forces in the counter-offence. Secondly, in order to give the opportunity for the counter-offence to be effective, a complimentary strategically static local defence force should be organised. In order not to disrupt production, this force must be raised locally from the producers of the country, volunteering part of their free time to this service. A local force, through the use of its peculiar knowledge of the terrain, if properly instructed, could be effective against the most modern German equipment: “A force organised in a similar way to that of the British Home Guard was, therefore, indicated as a strategic necessity in modern warfare”. One of the significant conclusions reached by the Americans was that they, themselves, were not immune to the German weapons of sabotage and espionage of ‘fifth columnists’. How better could a country be protected against those weapons than to have a force whose primary purpose is the protection of its country, and reaches into every city, town and village, into every home, office and plant? It seems that the Americans were impressed by the Home Guard. Perhaps, then, we too should be impressed. Most of the defences created for the Home Guard around Tewkesbury were cleared away at the end of World War II, but a few sites with local Home Guard connections can still be seen in the town. Of these, Sergeant Hanlon’s headstone in Tewkesbury Cemetery is perhaps the most poignant; then there is Healings Mill, the scene of his accident. The Old Hospital, the one-time headquarters for ‘E’ Company, is still there; as is the Drill Hall in Red Lane, now used by the cadets. Its bricked-up entrance, created to gain access for the Home Guard ‘Smith’ Guns, can just be discerned from Red Lane. On the road out of Tewkesbury towards Gloucester, a bricked-up loophole, facing up the Gloucester Road, can be seen from the pavement, up in the eaves of the house located near the entrance to the playing fields. This was part of the defences around the roadblock, long since cleared away, on the River Swilgate Bridge. Another, more obvious relic of the times, is the grid-pattern of trenches on the Ham, dug in 1940 to damage any enemy troop-carrying aircraft attempting to land there. 1. National Archive [NA], WO 163/414, Home Guard Sub Committee of the Army Council. 2. Harry Workman: each time he is cited it is from personal comments, when interviewed on 27 January 2011. 5. Jon Mills and Terry Carney, In the Space of a Single Day, Wardens Publishing, 2001. 6. 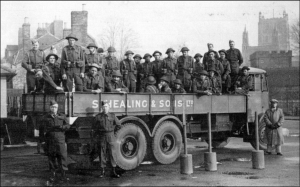 Regulars of the 162nd Infantry Brigade; Home Guard units from Churchdown and Dymock; the Aston Somerville, Bredon and Kemerton Platoons of the 4th Worcestershire (Evesham) Battalion Home Guard; the Upton Company of the 7th Worcestershire (Malvern) Battalion Home Guard; and A and E Companies of the 1st Gloucestershire (Cheltenham) Battalion from Bishop’s Cleeve. 7. The ‘Harvey Flame Thrower’ comprised a large pressure cylinder filled with flammable fluid, with a cylinder containing compressed nitrogen attached and connected to provide the propellant. A long flexible hose and nozzle allowed the operator to direct the flame. The equipment was carried on a two-wheeled trolley to provide portability, but it was essentially an ambush weapon. 8. NA, WO 166/3054, The War Diary of the 37th Searchlight Regiment. 9. The CO was Colonel Norris, DSO, OBE; from A History of U Company (Upton upon Severn) by Major Jewell, which was locally produced at the end of the war. 10. In addition there were Medium Browning Machine Guns, Browning Automatic Rifles (BAR) and Thompson Sub-Machine Guns. 11. 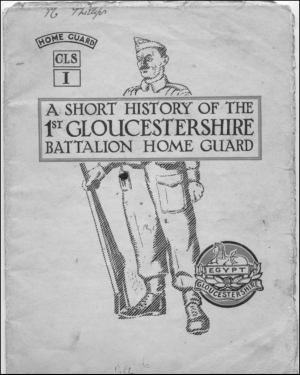 Most published Home Guard histories have information on the supply of weapons but attention is drawn particularly to George Over, The Story of A Sector, Warwickshire Home Guard, Rugby Ltd., 1946. 13. Bromsgrove, Droitwich and Redditch Weekly Messenger, 28 Mar 1942. 14. Major General Viscount Bridgeman. 15. Malvern Gazette, 11 Apr 1942. 16. 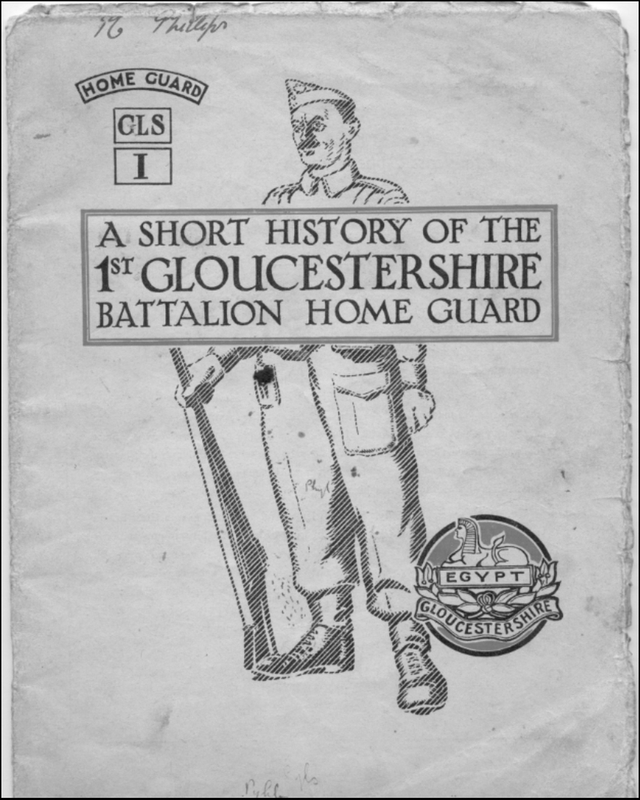 History of Tettenhall Battalion Home Guard, Staffordshire, produced by the battalion at the end of the war. 18. Personal comment by Edward Lane at an interview on 4 October 2010. 19. NA, WO 199/388, Home Guard Weapons. 20. NA, WO 199/398, Enrolment of Boys in the Home Guard. 21. NA, CAB 123/204, Cabinet papers on Home Guard and Civil Defence; ATS [Auxiliary Territorial Service], WVS [Women’s Voluntary Service]. 22. NA, WO 199/401, Home Guard Enrolment of Women 1942-44. 23. Major Shelley-Creak, ‘The Home Guard’, Firm, the magazine of the Worcestershire Regiment, January 1949. 24. Tewkesbury Register, 28 Nov 1942 and John Dixon, ‘Never has so much been owed ...’, THS Publication 4 (2005). 25. Part 1 Orders issued to the Redditch Battalion in 1942. 26. NA, WO 199/473, Bolero Key Plans. 27. NA, WO 199/387, Home Guard Training, including the general policy on ‘Vulnerable Points’. 29. L.B. Whittaker, Stand Down, Ray Weslake Books, 1990. 30. Colin Dobinson, AA Command – Britain’s Anti-Aircraft Defences of the Second World War, Methuen, 2001. 31. Tewkesbury Register, 13 May 1944; The salute was taken by Colonel C.W. Richmond. 32. NA, WO 166/14558; Worcester Sub Area HQ War Diary, 1944 & Interview of Edward Lane on 4 October 2010. 34. NA, WO 199/365, Home Guard Role. 35. Tewkesbury Register, 9 Dec 1944. A photograph of the Stand Down Parade is published in THS Bulletin 19 (2010) p9. Jim Workman used to work on the railways and was “a crack shot while serving with the Home Guard”. 36. Tewkesbury Register, 6 Jan 1945. 37. NA, 199/3301, Home Guard Affairs. 38. Jon Mills and Terry Carney, In the Space of a Single Day, Wardens Publishing, 2001; Brian Linnell, The Tewkesbury Volunteers (out of print). 39. NA, WO 163/414, Home Guard Sub Committee of the Army Council. 40. NA, CAB 106/1189, Report of the Massachusetts Committee on Public Safety.